I am the type of person who likes a plan. I like organization. I like schedule. I like routine. I am also the type of person who likes fun. I like surprises. I like to be random. I like to be impulsive. So you could see why I might not sleep much at night. Where I love to be social and having fun I crave order and responsibility. I think I may be crazy. So, in a perfect combination of my personality, I decided many months ago that I would move to Boston. With or without a job. With or without a home. I am going and nothing will stop me. I am taking a plunge, taking a chance, counting on faith. And you know what? It feels fantastic. 1. Preheat oven to 350 degrees F. Combine cake mix, applesauce, eggs and water and mix until well combined. Line 30 muffin tins with paper linings and spray well with cooking spray. Scoop batter bake in 30 greased medium muffin pan cups about 2/3 of the way. Bake for 19-23 minutes or until a toothpick comes out clean. Cool in pans 10 min. Remove to wire racks; cool completely. 2. Beat milk and dry pudding mix with wire whisk 2 minutes or until well blended. Let stand 5 min. Meanwhile, use serrated knife to cut cupcakes horizontally in half. Gently stir 1/2 cup of the whipped topping into pudding. Spoon about 1 tbsp of the pudding mixture onto bottom half of each cupcake; cover with top of cupcake. 3. Microwave remaining 1 cup whipped topping and the chocolate in small microwaveable bowl on HIGH 1-1/2 minutes or until chocolate is almost melted, stirring after 1 minute. Stir until chocolate is completely melted and mixture is well blended. Let stand 15 minutes to thicken. Spread onto cupcakes. REFRIGERATE at least 30 minutes before serving. Store leftovers in refrigerator. *These are much much better served chilled, unlike most baked goods in my opinion. So please, wait until they are cooled in the fridge before diving in! Oh my gosh! My favorite dessert just got cuter! 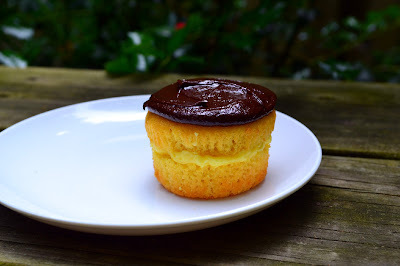 ;) I used to request Boston Creme Pie for my birthday growing up. Love this. Moving is so exciting! Have fun!!! And these cupcakes look delicious :). You and I are a lot alike...and I love to hear about this next step. Boston is such a great city! And of course, these petite treats are just adorable. They sound better than the big kind. Thank you for sharing with me, sweet friend. I hope you have a beautiful weekend that bursts with love, good food and joy.